I've often wondered how certain stones are designated as birthstones for given months, but not for June, pearl's month. The classic whites are crisp and cool in summer, and a traditional gift for weddings and graduations. The marketing people who concocted the idea of birthstones probably thought, "Well, June was easy." 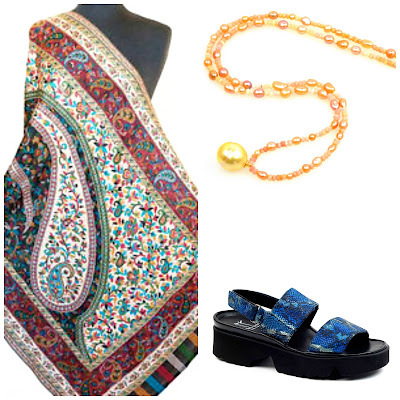 But I'll bet few readers are twenty-to-thirty year old brides or graduates, so in today's windows, grown-up pearls, pearls that refute the demure '60s image of what I call the baby-teeth necklace. Pearl Paradise put their white South Seas on sale for June, oh mama—but they are still a major purchase. 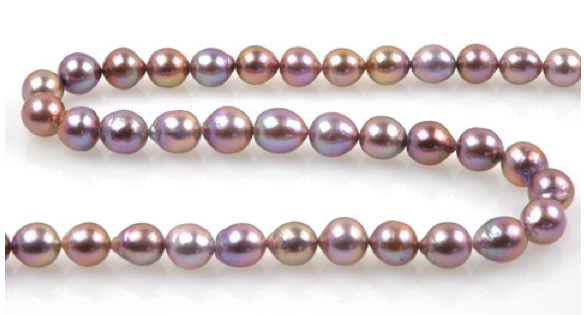 Though PP offer some grande dame gumballs, my choice would be the 9.1-12.2mm near-round-to-baroque strand, because I like the more organic look of the variation, they drape well, and the price ($1, 950) does not equal, say, a car, like those huge rounds. A pendant gives pearly pleasure for far less. But not the boring round-white-with-tiny-diamond that a girl gets. Go badass, sisters! 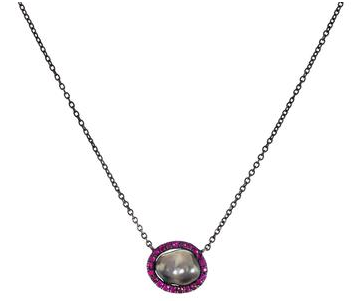 Savannah Stranger's ruby and grey pearl equator pendant is all that; set in blackened 18k white gold, the 7mm x 9mm pearl is surrounded by .15ct of rubies. That attitude costs $2, 300. If you like the piece but not the price, you might have a similar one made. 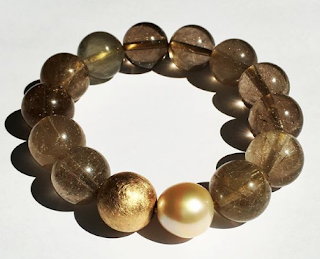 Repurpose a chain you're not wearing (the 'blackened' look can be achieved with oxidized silver, far less costly than gold), invest in lively little stones for the halo (consider tourmaline or garnet, if ruby is too expensive), and buy a pearl with mesmerizing orient. For that, I suggest one of Kojima Company's shimmering sherbert pearls (pearl shown is a plush 14mm x 11.3mm; price, $45) a superb value. You can see my scoop of sherbert here, in a pendant. 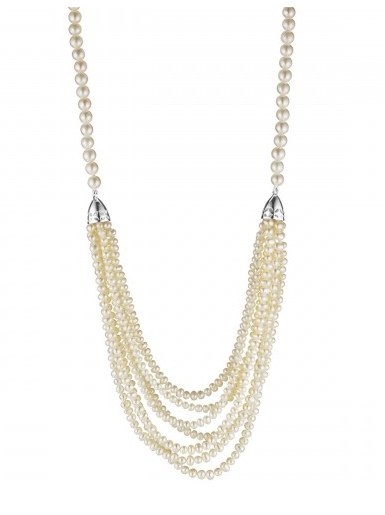 If my birthday were in June, I'd treat myself to Jan Logan's Gatsby necklace, a multistrand bib accented by sterling silver. Definitely more siren than demure deb, extremely wearable, and relatively light because of the design. The price is a reasonable $AUD 385. One last splash, and in colour, because while whites look especially summery, there's a world of knockout natural hues in freshwater pearls, with prices far under South Seas. I keep circling back to drool over Kojima Company's extra-long (19-inch) strand of 10.6mm -12.5mm lavender freshwaters, which will string up to at least 20 inches. 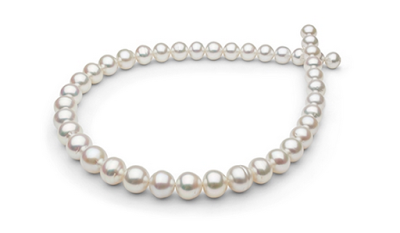 That's a boon for women who need more length, and if you prefer a shorter strand, save the extra pearls for earrings. I'ld forgotten that earlier post - love the sherbert pearl with the moonstones, a lovely combination, they enhance each other perfectly. Thanks to your inspiration, my deb pearls will be re-purposed as part of a necklace or bracelet. I'm going to combine them with peridots and turquoise, haven't decided on the metal component yet. It's fun to play with ideas so I'm in no hurry. Dear Duchess, thanks for your wonderful advice. My beloved vintage faux pearl strand just got undone (it was knotted, so I didn't lose any beads, but finding someone in Paris, where I live, to knot it anew is going to be tough). So I decided to take a bold step and purchase real pearls. I found your blog, and am stuck in dilemma: Pearls of Joy's "baby ripple" (the closest in appearance to my old strand), their baroque strand, or the amazingly creative stuff at Kojima. All thanks to you... Merci! 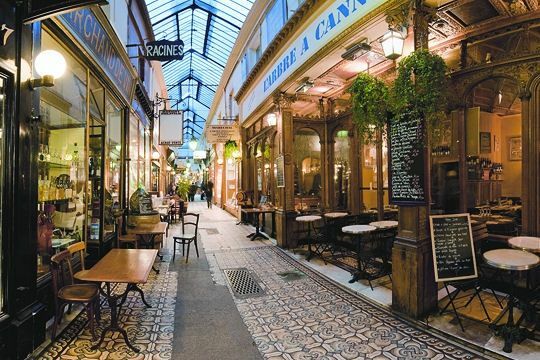 Catherine Delors: Coincidentally, I am in Paris now. Do tell us what you chose! Though an old strand may be beloved, it may not necessarily be the right strand for you today. Besides the pearl variety, consider size, lustre, over and undertones and whether the pearls have any pits, dull areas or other flaws. The vendors you mention have excellent return policies so you have time to try on and decide. For restringing of costume jewellery beads or pearls, try a bead store. As for the old ones, thanks for the tip about the bead store. I think there's one in the Marais near Mariage Freres. I hope you enjoy your stay in Paris, and very much look forward to your next posts.